Get 20% off your order when you spend $100 at this shop. Discount shown at checkout. Sale does not include custom, made to order or layaway. 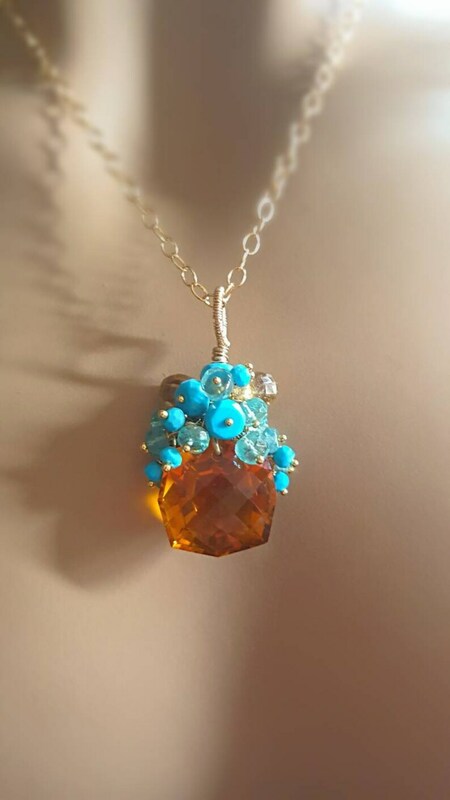 A gorgeous fancy cut natural untreated checkerboard faceted citrine, sits proudly beneath a bountiful cluster of wire wrapped sleeping beauty 2-3mm faceted rondelles with 3mm apatite rondelles each wire wrapped in gorgeous 22k gold vermeil headpins into a cascading cluster that drapes atop the beautiful focal point gemstone. A gold filled handformed coil creates a beautiful artisan bail to attach to the necklace. 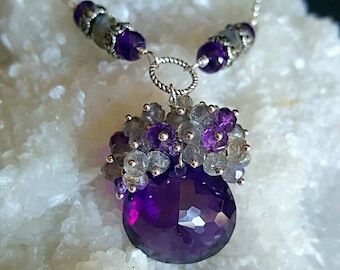 A stunning necklace for any occasioon, a perfect gift for the november birthday girl or for anyone to enjoy for years to come. Finished with a pretty gold filled link chain, strong enough to carry the pendant. Pendant length is appx 2" with an 18" chain. Has a pretty gold filled lobster claw clasp. An 2" extender is included. Your pendant necklace will come gift wrapped beautifully boxed with polishing cloth and zip lock bag for storing. *****By purchasing any item in my shop, you agree and accept all applicable policy terms. It is my goal to provide you with a long lasting beautiful piece of jewelry, that you'll be proud to wear for many years. I take great care in the construction of my pieces to ensure just that. You'll notice the difference in the quality and added value. please feel free to convo me. 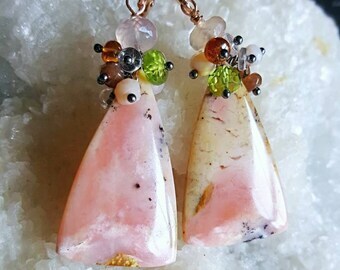 I love Ethiopian opals. 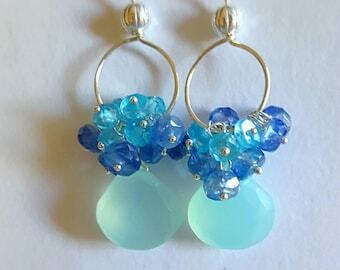 And these earrings display them perfectly with the added touch of moonstones. Jut gorgeous!! SPECTACULAR!! HUGE gemstones. Gorgeous color and super flattering design! Seller so helpful with fast shipping in time for Easter! Am a repeat customer. 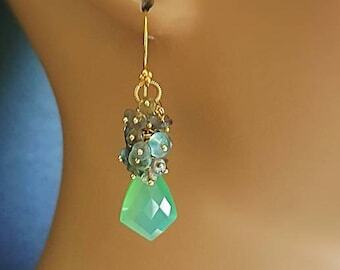 Beautiful earrings, customized to my request. Will look great with summer outfits. So Sweet! Love The Colors! Thanks! Ordering from another country? Not a problem. 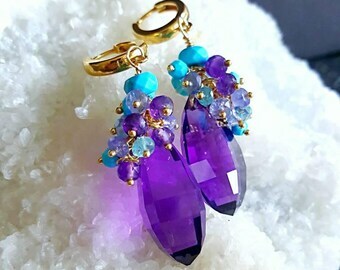 International orders may require addl fees as deemed by your country's customs and are not in any way regulated by my shop..
***Due to health & hygiene concerns, earrings are not returnable with international orders. By purchasing from outside the USA, you accept and agree to these terms. Custom and personalized orders are most welcome. Let's co-create something special for you or someone special. Simply request what you want and when you need it. Allow additional time for processing may take 2-5 weeks. I take great pride in my creations, so I equally care that it arrives safely and is beautifully presented for the receiver. You may request addl care, however you should know that I usually box and wrap each item with ribbon and accents. I also include storage bags, zip lock bags, instructions for care and a cleaning cloth. I do welcome wholesale requests. Just send me a convo to discuss quantity, availability and cost information. Yes, layaway is a great way for you purchase your favorite designs and spread payments out in affordable payments. Here's how it works.. Mind you custom, items on sale or clearance not applicable. 1. Send me a convo with the desired listing attached. Payments are split into 3-4 equal payments over 30 to 45 days. 2. First payment will include shipping. Details of payments will be outlined in each listing. 4. Your items will ship after completion of last payment. 5. Layaway agreements not completed in a timely manner will be forfeited. Items will be placed for resale. Only shipping will be refunded. Please note that shipping prices include fees deducted by Etsy and Paypal, and a portion of the cost of shipping materials. To clarify, Etsy and Paypal take a percentage of the shipping costs as their fees. DO NOT INCLUDE CUSTOMS FEES, TAXES OR ANY FEES CHARGED BY YOUR COUNTRY'S REQUIREMENTS...If a package is refused and returned to me, YOU WILL NOT GET A REFUND OF ANY KIND, NO EXCEPTIONS.